Did you realize that we offer what is referred to as Early Intervention Orthodontics? Early interceptive orthodontic treatment usually starts before the eruption of the permanent teeth or when the child has very few permanent teeth present. Our goal at Dr. Boule’s office is to guide the growth of the upper and/or lower jaw to make adequate space for the eruption of all the permanent teeth. We feel that children should be evaluated by the age of four to see if there is a bone problem (orthopedic) or a tooth problem (orthodontic). Improve profiles, smiles and self-esteem. Upper eye teeth (cuspids) are the last teeth to erupt on the upper arch. If the jaw is too narrow, patient will get the fang look. Prevent possibility of facial asymmetry with the expansion of the upper arch and the correction of the posterior cross-bite. Improves head posture which helps eliminate neck pain. Prevents grinding of the teeth at night. Orthodontic treatment can be beneficial at any age and approximately 25% of today’s orthodontic patients are adults. Teeth can be moved at any age and therefore more adults are proceeding with orthodontic treatment in an effort to achieve straight teeth and a beautiful smile. No two smiles are alike, and therefore no two orthodontic treatment programs are either. Typically, active treatment times range from one to two years and vary with the degree of tooth movement and the severity of the problem. However, we also offer specialized clear braces to gently straighten and align teeth in an average time of just 6 months. This is called 6 Month Smiles. How would you like to have straight teeth in 5-9 months? Call our office at 315-682-5200 315-682-5200 to see if "6 Month Smiles" is right for you. Another option is invisible braces called Invisalign/Teen Invisalign. 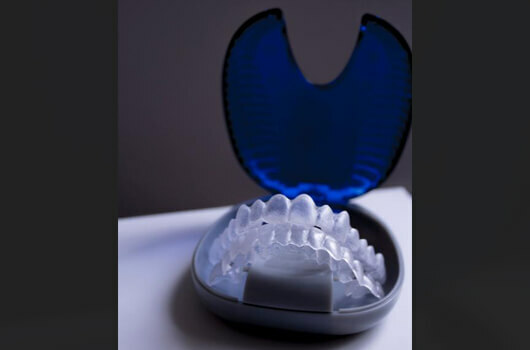 This type of orthodontics is a removable clear tray system, that allows you to take out the trays for eating and drinking purposes only. Many adults like this option. If you have crooked teeth or you don’t like your smile, come in for a no charge consultation appointment to determine which treatment is best for you. You are never too old to improve your smile.